Just weeks after taking office, Mexico’s new president, Enrique Peña Nieto, ordered the arrest of the country’s most powerful union leader, Elba Esther Gordillo. The move garnered international headlines and was widely cast as a sign that the government was serious about cracking down on corruption. But virtually no one in Mexico believes that was the real reason for her arrest. The timing alone suggests a different interpretation. Gordillo, president of the National Union of Education Workers (SNTE), was charged with embezzlement and removed from office in late February—shortly after the Mexican Congress gave its final approval to an education reform program that is despised by most of the country’s teachers. Gordillo was a longtime ally of the famously corrupt Institutional Revolutionary Party (PRI), the party not only of Peña Nieto but of the disgraced former president of Mexico, Carlos Salinas de Gortari, who imposed her as the union’s president in 1989, after forcing her predecessor to resign. Although Gordillo was forced out of the party several years ago in a power struggle, she remained one of the most powerful politicians in Mexico. An anti-democratic union leader, Gordillo may well prove to be guilty of the charges leveled against her. But what placed her in the cross-hairs of Mexico’s corporate elite was more likely her inability to keep teachers under control as the country moves forward with its latest neoliberal reform—this time of its schools. One leader of the progressive opposition within the SNTE, Juan Ortega Madrigal, warned that Peña Nieto “is totally wrong if he believes that he can silence the voices of 500,000 teachers by decree,” adding that they would not “abandon the defense of public education.” The teachers backed up that sentiment with a two-day national strike. 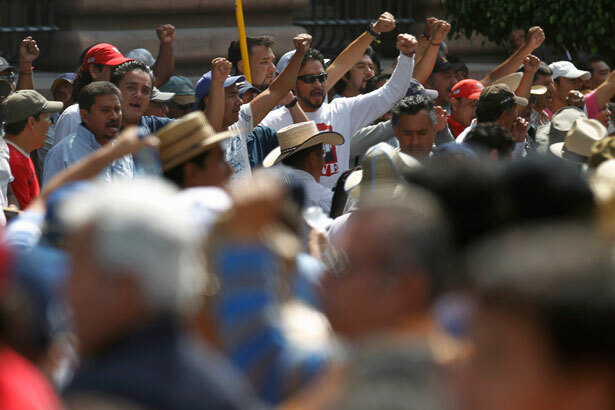 Rubén Núñez Ginez, the head of Oaxaca’s teachers union, said they would not permit a law to take effect that attacks public education and the rights of teachers. Since the fall, teachers have been demonstrating and striking against the PRI’s proposal, which would tie their jobs to standardized tests and remove the voice of the union in hiring. But the corporate offensive to gain control of the country’s schools was launched long before Peña Nieto took office. A network of large corporations and banks extends throughout Latin America, financed and guided in part from the United States, pushing the same formula: standardized tests, linking teachers’ jobs and pay to test results, and bending the curriculum to employers’ needs while eliminating social criticism. The medicine doesn’t go down easily, however. In both countries, grassroots opposition—from parents and teachers—has been rising. In Seattle, teachers at Garfield High have refused to give the tests. In Michoacan, in central Mexico, sixteen teachers went to jail because they also refused. Today, the most powerful organized resistance comes from the southern Mexican state of Oaxaca. Here, teachers have proposed education reform that gives more voice to teachers, students and parents, allows them to work creatively together, and enhances critical thinking. Because of political changes in Oaxaca, they have the power not just to propose ideas like these but also to implement them. Teachers have an answer to this question, but so does Mexico’s corporate elite. “In Search of Business Sustainability,” a report by the Intelligence Unit of the British magazine The Economist, documents growing corporate involvement in Mexican education. Coca-Cola and Ford have built model schools. The Televisa Foundation organizes seminars for teachers and administrators. Industrialists for Basic Education (which includes the food giant Bimbo) pushes changes in curriculum and teaching standards. Founded in 2005, Mexicanos Primero advocates standardized tests and merit pay for teachers based on test results. These principles were incorporated into the Alliance for Quality Education (ACE), negotiated in 2008 between the union’s Gordillo and then-President Felipe Calderón. In 2009, the government began administering a national standardized test for students, called ENLACE. Advocates of the corporate education reform agenda point to the poor results by Mexican students on the PISA (Programme for International Student Assessment), which is given by the Organization for Economic Cooperation and Development (OECD), an association of wealthy developed nations. In 2009, 50 percent of 15-year-olds scored a level 2 or below (on a scale of 0 to 5) in math or science. “In Mexico, there is a great difference between communities,” Torres says. “Some schools function very well because they have resources and the attention of the families. Others don’t. That doesn’t justify bad conditions, but to think that the only ones responsible are the teachers is just not true.” Eduardo Bravo Esqueda, formerly of the National Institute for the Physical Infrastructure of Schools, notes that “students study for six hours a day…where the temperature rises to 104 in the summer or where they freeze in the winter.” According to Hernández Navarro, over 26,000 of the 223,144 basic education schools have no water, and many have no functional bathrooms or lighting. Nevertheless, Mexico’s testing system has begun to tie teachers’ jobs to the test results. “If they don’t achieve the educational goals, that’s when the firings begin,” Torres says. In “Advances in the Reform of Basic Education in Mexico,” the OECD called for putting teacher-training schools (called “normal schools”) on probation pending necessary reforms while opening the door to private ones. It also urged incoming President Peña Nieto to fire teachers whose students perform poorly on standardized tests and exclude them from teaching. Similar measures are also advocated by a Washington think tank, the Partnership for Educational Revitalization in the Americas, a project of the Inter-American Dialogue. PREAL, “the strongest private voice on education in Latin America,” supports the goals of Mexicanos Primero. Its director, Jeff Puryear, a former Ford Foundation officer, spoke at the ¡De Panzazo! screening. In addition to funding from the World Bank, PREAL received grants from the US Agency for International Development of more than $6 million from 2001 to 2006, and nearly $12 million from 2007 to 2012. Puryear says that “PREAL has done very little in Mexico,” citing a conference and a few studies. According to USAID staffer Raphael Cook, PREAL has provided funds to local partner organizations in other countries in the region, including Businessmen for Education in Colombia, the Business Foundation for Educational Development in El Salvador and the Private Sector Council for Education Assistance in Panama. Mexican teachers resist this idea and demonstrated for months when the ACE was introduced in 2008. This February, thousands of teachers filled Mexico City’s streets, protesting Peña Nieto’s education program. They were organized by the rank-and-file caucus, the National Coordination of Education Workers (CNTE), which for decades has battled the leaders of Mexico’s teachers union—including Gordillo. The CNTE took aim at the alliance between the government, the national leadership of their union and corporate education reformers. While still president of the SNTE, Gordillo and Mexicanos Primero’s González shared a platform at a 2011 conference called “Competitiveness and Education.” There, González called CNTE strikes in Michoacan and Oaxaca “a crime against youth.” He called the normal schools “a swarm of politics and shouting” and demanded that the government replace them with private institutions. That fall, police killed three students from the Ayotzinga Normal School in Guerrero after the students there blocked a highway. Another principle is equality. “Schools in the heart of the city should be equal to those in marginalized communities,” Lavariega asserts. To achieve this, the PTEO process forms collectives, first among teachers and other school staff and then including parents, students and community leaders. “Communities should be able to generate their own educational process,” he explains. The school collective decides on an educational project, implements it and holds everyone accountable. The Oaxacan teachers have battled successive state administrations for years. In 2006, a Sección 22 strike became a virtual insurrection, and the national government sent in heavily armed police to suppress the rebellion. In its wake, the left-wing Democratic Revolutionary Party and the right-wing National Action Party organized an unwieldy coalition and defeated the PRI in the 2010 state election for the first time. Heavily supported by Sección 22, former Oaxaca City Mayor Gabino Cué became governor, opening the door for the PTEO. When Cué came into office, he signed an initial agreement with Sección 22 to begin implementing the PTEO, which began in 280 schools last May and June. Each had to set up a collective, analyze the needs of students and the community, and come up with an education plan. In February, however, just before Gordillo’s arrest, Claudio González went to Oaxaca and warned Governor Cué that he had to “break the hijacking of education by Sección 22”; he also called the teachers “tyrants.” That was too much even for the state’s school director, Manuel Iturribarría Bolaños, who accused González of having come to the state to provoke a fight. Teachers picketed the Mexicanos Primero press conference, and González fled back to Mexico City. Migration from Oaxaca to the United States has risen sharply in the last twenty-five years. While the reform debate goes on, Oaxacan students still leave school every year and head north. Rendon coordinates programs to track them as they migrate with their parents in search of work. One sends Oaxacan teachers to the United States to help those students. Another brings California and Oregon teachers to Oaxaca, to better understand the culture of these migrant children. In September of last year, The Nation, in the print magazine and on the website, presented two contrasting views of the Chicago teachers’ strike by Melissa Harris-Perry and Matthew Cunningham-Cook.